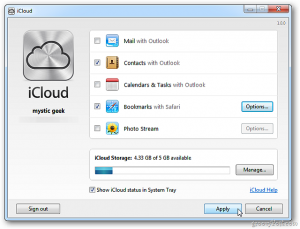 iCloud is not just for Macs… – Tech Geekery, Inc. I know this tip is not super technical in nature, but it has come up before so I figured I would share. This little tip is for you Windows folks who have an iPhone, iPad or other iCloud enabled device. Did you know that there is a Windows iCloud Control Panel? After you have set up iClould on your other device, you can download it here from the Apple website. Once it is installed and your Apple ID has been entered, you can enable syncing of contacts, calendars, bookmarks, and Photo Stream. The version linked above has support for Vista Service Pack 2, Windows 7 and Windows 8. Just keep in mind that once this is set up, you will still need Outlook (2007 or 2010) or a browser that is up-to-date to view email, Contacts and Calendars. You can read more from Apple about setting it up here.